Wokingham and Wisbech, UK - 9th November 2015. EnSilica, a leading independent provider of semiconductor IP and design services, has appointed Anglia Components as its business development partner in the UK and Ireland for its eSi-Modules family of FPGA based system-on-modules. Anglia will target the eSi-Modules at key vertical industry sectors including utilities, smart cities, oil and gas, access control, medical devices, IoT, industrial internet and telematics. "We have been seeking to appoint a business development partner for some time to extend the market penetration of our eSi-Modules family," said Ian Lankshear, CEO of EnSilica. "With its strong application knowledge, extensive team of field application engineers, good outreach into key vertical markets, excellent geographical coverage and complementary product lines, Anglia is the perfect choice." John Bowman, Marketing Director of Anglia added, "Ensilica helps us to offer a solution for both existing FPGA users and for customers who have a design which requires a FPGA but perhaps don't have the budget or design resource to develop their own solution. 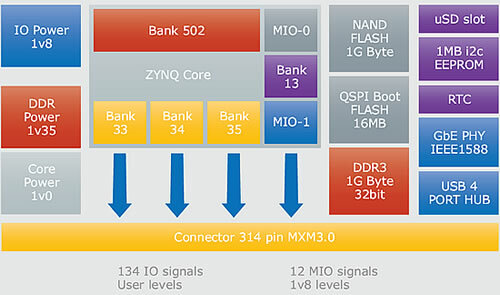 Anglia already has a very strong range of advanced companion ICs for FPGA based designs from Analog Devices, Intersil, Avago and Murata Power Solutions." EnSilica's eSi-Modules family currently comprises the eSi-ZM1 small form factor system-on-module built around the Xilinx Zynq extensible programming platform with Xilinx Series-7 FPGA fabric and powered by an ARM dual-core Cortex A9 processor running embedded Linux. This is supported by the eSi-ZB1-DK full development kit comprising carrier board, ZM1 module and a power supply, and eSi-ZB1-BB carrier board without ZM1 module. "By encompassing the challenging part of an embedded system into a small module, EnSilica's esi-ZM1 dramatically simplifies baseboard development both in terms of the number of layers and layout complexity," commented David Pearson, Anglia's Technical Director. "Combining a powerful dual-core ARM A9 subsystem running embedded Linux together with the Xilinx Series-7 FPGA fabric enables the design of smarter systems that demand real-time hardware performance." The eSi-ZM1 facilitates low risk and fast-time-market development with minimal integration effort across a range of applications and hardware designs without sacrificing differentiation or flexibility. It is unique in providing an exceptionally high I/O count, delivering the full capability of the FPGA fabric without sacrificing signal integrity. 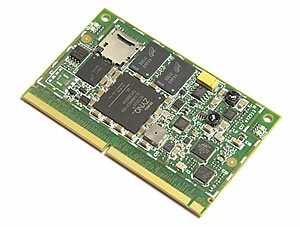 It provides a broad range of advanced I/O including gigabit Ethernet, USB, I2C and SD card. Ready to use out-of-the-box, all standalone module sales will be handled by Anglia with EnSilica supporting its direct OEM accounts and Anglia's customers who require FPGA implementation, software development and verification engineering support on a case-by-case basis. EnSilica was founded in 2001 and has a strong track record of success in delivering semiconductor IP and providing ASIC/FPGA design services to semiconductor companies and OEMs worldwide. The company is headquartered in the UK and has offices in India and the USA. The company is a specialist in low-power ASIC design and complex FPGA-based embedded systems including hardware and embedded software development. In addition to providing IP and turnkey ASIC/FPGA development, EnSilica also provides point services to companies with in-house ASIC design teams. These services include system engineering, analog and mixed signal design, and advanced verification using UVM, DFT and physical implementation. For further information about EnSilica, visit http://www.ensilica.com. Anglia is the UK's leading independent authorised distributor of semiconductors, optoelectronics, interconnect, and passive and electromechanical components. A signatory of the ADS SC21 programme, the company holds AS9120, ISO9001 & ISO14001 accreditations and IECQ-CECC qualification. Technically adept, with an experienced team of staff, Anglia supports OEM and EMS companies in every sector of electronics manufacturing. Anglia's suppliers include some of the world's leading electronic component brands, complemented by many smaller companies with leadership in their chosen technologies. Anglia stocks over 800 million components from over 700,000 product lines in the UK. Components from every supplier are stocked in depth and breadth for same-day dispatch. Anglia aims to streamline logistics and reduce customers' transaction costs through services that include KAN-BAN, EDI, and customer-dedicated inventory, while an accurate, on-time delivery performance is a vital goal for the company. Technical support spans a sampling service that delivers over £150,000 worth of free evaluation parts each year and expert technical advice from well-trained product specialists and face-to-face guidance from field applications engineers. Both commercially and technically, management of industry legislation and component obsolescence are recognised as areas of vital importance to customers. Anglia is driven by an ethic of ever-improving customer understanding and, as a privately owned business, aims to provide a fast, consistent and highly responsive service. Further information can be found at http://www.anglia.com. Click here for more information or buy from Anglia-Live.